Perfect! Especially the stuff was very nice and helpfull. The food ist very good, the cleaning was perfect, the location is very nice: its the nices/highest place in Santorini with the most beautiful sunsets; walking distance to many restaurants and places; it`s quiet; you have parking space infront of the hotel which is super important because you need a car in Santorini. We would definately recommend this hotel! Lock in a great price for Ampelonas Apartments - rated 9.5 by recent guests. Located in the picturesque Imerovigli Village, Ampelonas Apartments offers a free form outdoor pool, poolside bar and sun terrace. The Cycladic-style accommodation offers panoramic views of the Aegean Sea and of the caldera or the vineyards. Featuring internal archways and whitewashed walls, the studios and maisonettes are bright and airy. Each comes with air conditioning, TV, fridge, coffee maker and hairdryer. They all open out onto a private terrace or balcony. 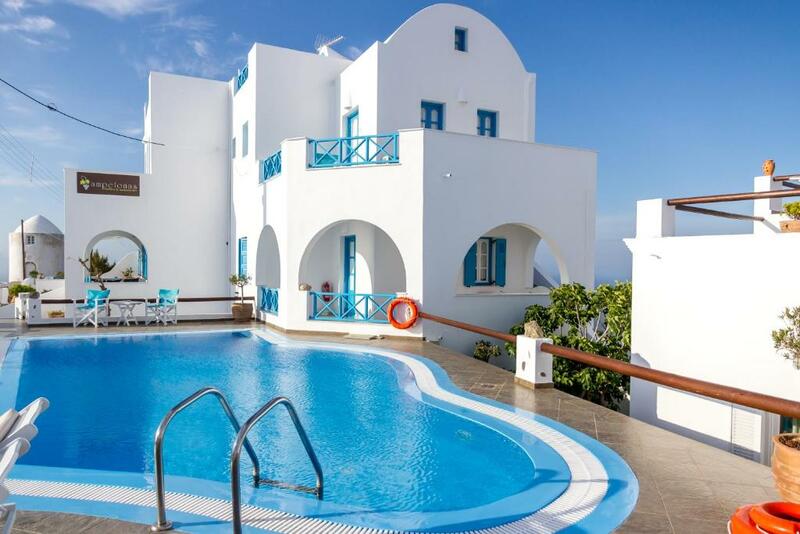 Ampelonas Apartments is 1.2 miles from the bustling town of Fira. Santorini Airport is at a distance of 5 miles whereas the port of Santorini is 6.2 miles away. Ampelonas Apartments has been welcoming Booking.com guests since 3 Nov 2010. Studio with view over the vineyards. It includes a double bed, bathroom, WiFi, air conditioning, refrigerator, satellite TV, hairdryer (on request) and balcony or terrace. Two-storey apartment with internal staircase and Caldera view. It features a double bedroom upstairs. Downstairs it includes a double bed, sofa bed, bathroom and living room. It comes equipped with WiFi, air conditioning, a refrigerator, satellite TV, hairdryer (on request) and balcony or terrace. House rules Ampelonas Apartments takes special requests - add in the next step!